Magnetic Press has been putting out high quality graphic novels for the last three years, and after being acquired by Lion Forge Comics in October of last year, the publisher has gained some extra stability allowing it to continue bringing exciting new projects to U.S. readers. The company primarily focuses on English translations of foreign graphic novels, and The A.V. 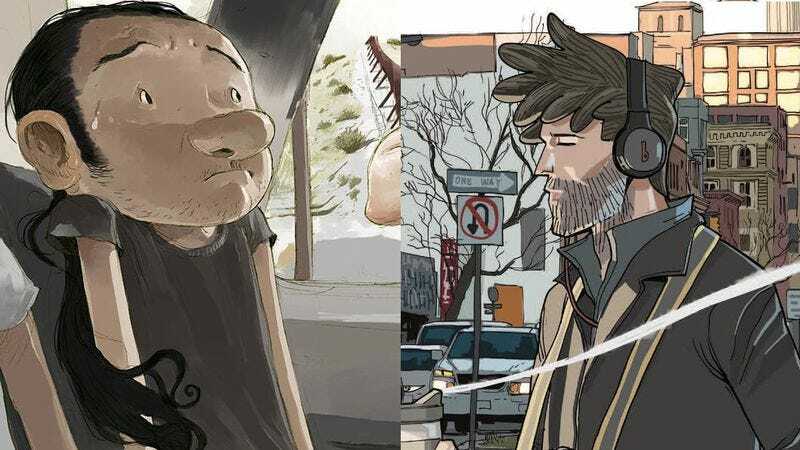 Club has previews of two of Magnetic’s newest releases: Tony Sandoval’s Rendez-Vous In Phoenix and Giacomo Bevilacqua’s The Sound Of The World By Heart. These two books take very different approaches to romantic stories: Sandoval’s autobiographical title details his journey illegally crossing the border between Mexico and the U.S. in order to visit his American girlfriend, while Bevilacqua examines a broken heart through one man’s vow to not speak to another person for 60 days. RENDEZ-VOUS IN PHOENIX - book trailer from Neurobellum on Vimeo. These titles are stark contrasts in terms of content and style, but they both feature strong, confident points of view paired with remarkable craft. Sandoval is a three-time Eisner Award nominee with an exaggerated, cartoonish aesthetic that heightens the expression of his characters, and that richness of emotion brings a lot of weight to Rendez-Vous In Phoenix. This is a grounded, deeply personal work for Sandoval, and he does remarkable work putting the reader in his shoes and making them feel the full gravity of his situation. Sandoval’s story is especially relevant given recent news that President Trump is fast-tracking his plan to build a wall along the U.S.’s southern border, and this graphic novel provides an important perspective of someone trying to cross the border for no purpose other than to be closer to the person he loves. SOUND OF THE WORLD BY HEART - 2017 trailer 720p FULL from Neurobellum on Vimeo. Bevilacqua’s story is also rooted in his personal experience, but it’s not wholly autobiographical, reinterpreting the Italian cartoonist’s time in New York City through the eyes of a photojournalist named Sam. The detail Bevilacqua brings to the urban setting in these preview pages is phenomenal, and he successfully creates a strong sense of isolation in the midst of a bustling city. The use of color and shadow is especially impressive, and Sam’s general grayness reinforces his emotional distance from the vivid world around him. Rendez-Vous In Phoenix is available now while The Sound Of The World By Heart goes on sale March 29, and readers can learn more about these books by checking out the above book trailers and the excerpts below.